There's a moment just a few songs into Sting's live concert video, Rough, Raw & Unreleased: Live At Irving Plaza, that recalls the effortless power and grace of The Police in their prime. The song is “Synchronicity II,” and the legendary bassist and frontman is leading his solo-career touring band through that song's tricky high/low, loud/soft textures. Sting's voice - still strong and supple - glides above the swirl of Dominic Miller and Shane Fontayne's guitars. Meanwhile, drummer Josh Freese rides the high hat diligently, replicating Stewart Copeland's impossibly tight fills on the snare. It's the concert film's musical highlight, and if it's not the real thing without the original Police men, well - it's delightfully close. Filmed in New York City on the final night of Sting’s U.S. tour in 2005, Rough, Raw and Unreleased is anything but rough and raw. The filmmakers have taken all the proven techniques of the trade and put them together in a solid and polished, if too-short, concert film. 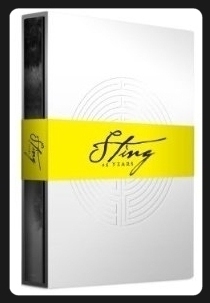 This previously unreleased DVD is part of the box set Sting: 25 Years, which also includes a hardcover memorabilia book and three CDs of remastered tracks from Sting's solo career. For fans of The Police - and really, who isn't? - it's a thrill to hear the estimable Mr. Sumner singing again about those shiny metal boxes and dark Scottish lakes. As he informs the crowd about midway though, Sting enjoyed playing a lot of old songs on that particular tour, and the evening's set list includes tracks from both The Police and Sting's earlier solo work. The concert begins with that old chestnut “Message in a Bottle,” which sets the tone for the evening. Sting and company play the song relatively straight, tossing in a few variations on the vocal melody and guitar dynamics. Throughout the short, 11-song set, Sting has clearly chosen songs from the catalog that tend to translate best to live performance, due to their straight-ahead simplicity and/or disciplined minimalism. For instance, The Police's “Driven to Tears” and “Next To You” - or, from the solo years, a scaled-down version of “Lithium Sunset” from 1996's Mercury Falling. Riding this minimalist vibe, the band also pulls of an odd yet totally ace cover of the Beatles' “A Day in the Life.” The song begins with simple bass line, gentle high hat work, and apreggiated chords from Miller. The boys gradually open up the sound with chiming guitars and big drums for that famous closing crescendo. Less successful is a number like “Heavy Cloud, No Rain,” which is simple enough, but too slow, too conventional, and too old-school-bluesy to really register with a band this tightly wound. As a frontman, Sting can still charm the pants off a crowd and clearly has a good sense of humor about his status as an elder statesman of rock. Later he jokes, “This tour has been about me finding my roots,” then pretends to check his trademark blond hair. Har! It's all slightly disingenuous, of course, because Sting is famously among the most well-preserved rock stars on the planet. (He was a sprightly 53 when the concert was filmed.) Throughout the show, Sting sports a bright blue shirt and tasteful pinstriped jacket. Until the encore, when he ditches the jacket and - to the delight of the crowd - unbuttons the shirt all the way, revealing a ridiculously handsome torso. Damn that man! How does he do it? As a concert film, Rough, Raw & Unreleased is equally well-put-together. The camera work is nice all around, with a master shot camera at back of the house, another behind the band, one under the drummer, one guy braving the fans in the photographers' pit, and at least two guys off in the wings or roaming the stage. 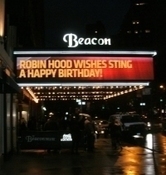 The editors use a palette of shots – kinetic pans and zooms, one- and two-shots, close-ups on instruments, crowd shots, and plenty of coverage of Sting's enduringly handsome self. There's a real art to cutting these things together. Film geeks can tell you – each cut produces a string of images that creates a visual narrative as the song plays out. You see the drummer smiling as he kicks back into the groove with the bass, then over stage left the guitarist is up near the crowd interacting with the front row. When done properly, as it is here, it all tells a story. Minute-to-minute, it's the story of this band playing these songs to this crowd on this particular night. A good live concert video puts you there. But this is a minor complaint, of course. Rough, Raw & Unreleased: Live At Irving Plaza is a real pleasure overall, showcasing a veteran rock and roll professional doing what he does best. This review is not good for my bank account.